It’s finally done! The long awaited FPV video from my visit to Florida, Miami and the Everglades. It was such a cool place to fly FPV. My favorite flight was probably when I got to chase the airboat. I knew tigers were big but until you meet one face to face you can’t really imagine how massive and powerful they really are. Luckily this tiger was super well trained and were more like a big cat than a fierce killer. The alligators really wanted to eat the Tricopter and jumped all over the place. I had to be really careful as not to get video of the digestion system of an alligator when flying around. If someone told me a couple of years ago that I was going to fly a triangle of wood with a camera strapped to it, filming tigers and alligators, I would have laughed. I’m so glad that I had the luck to get to do this. This video is made from 7 different flights. In this video the Tricopter is equipped with hacker motors instead of the usual AXN2213 motors. The reason behind this is that the AXN motors were killed in the crash into saltwater during the video “Cancún”. I personally prefer the AXN motors to the Hacker on the Tricopter. During some flights the Tricopter was equipped with two GoPros. One facing forward, the other facing downwards. I still use the original frame from the first Tricopter build. Although it looks like I’m hitting the airboat driver in the video, I’m not that close. I cut the throttle and let the Tricopter take the hit instead of our airboat driver. The airboat driver asked afterwards why I crashed instead of flying passed him. He didn’t feel that is was as close as I did apparently. Although the crash looks pretty hard, nothing broke. I flew another 2 flights that day. The most gentle and cuddly cat I’ve ever met. 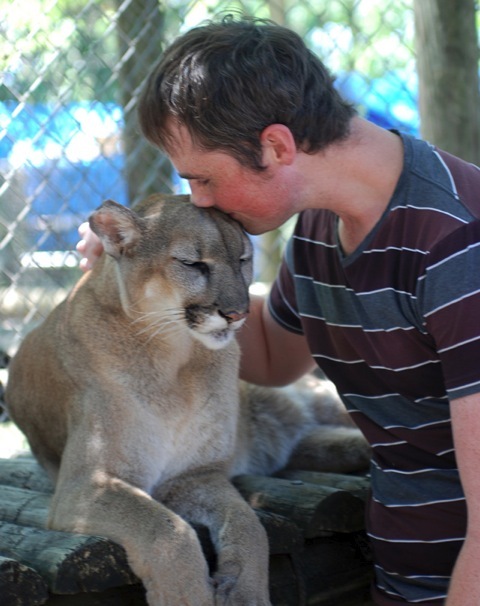 Willow is a Florida Panther and lives at The Outpost. The tiger loved the Tricopter which actually made it harder to film as it constantly wanted to get underneath the Tricopter and out of frame.